The cheesy goodness of this dish is achieved by using 4 different cheeses: cottage, mozzarella, feta and Munster. So don’t skimp! Make sure to squeeze out as much moisture from the spinach as you can: wrap the thawed spinach in a towel and wring out the liquid. Crumble the spinach over the mixing bowl to ensure even distribution. Cover the dish after 30 minutes with a piece of greased tin foil – or you will have a sticky mess on your hands when you try to unwrap the pan. Wrap any leftovers – they heat beautifully! Let me know how it turned out and enjoy! 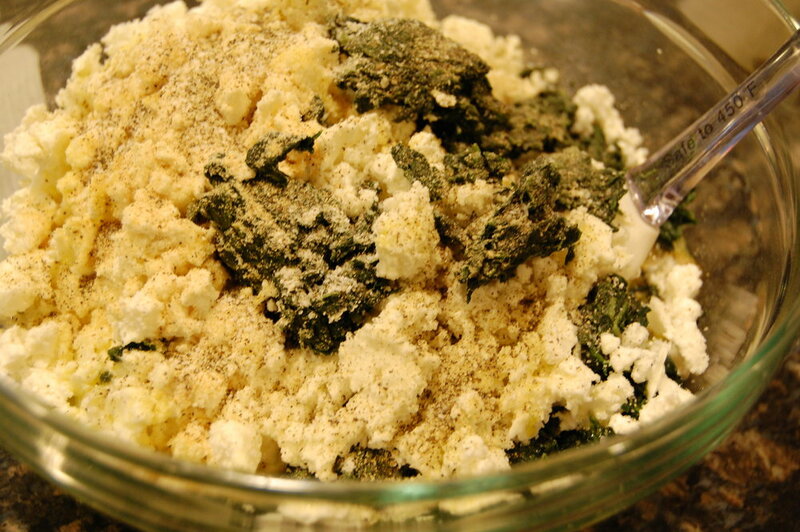 Mix all cheeses, farfel, eggs, spinach and seasoning in a large bowl until well combined. Pour the mixture into a greased 9” x 13” pan. Top with slices of Muenster cheese and top that decoratively with slices of tomato. Cool in the pan for 5-10 minutes, slice into squares and serve immediately.